As the legend has it, Medusa is one of the three Gorgonas that are female monsters in the underground world in Greek mythology. The snake-head Medusa, one of the three sisters, has the power of gorgonising the ones that happen to look at her. 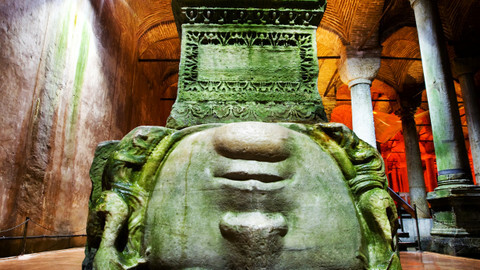 Accordingly, Gorgone paintings and sculptures were being used for protecting big structures and special venues in that time. 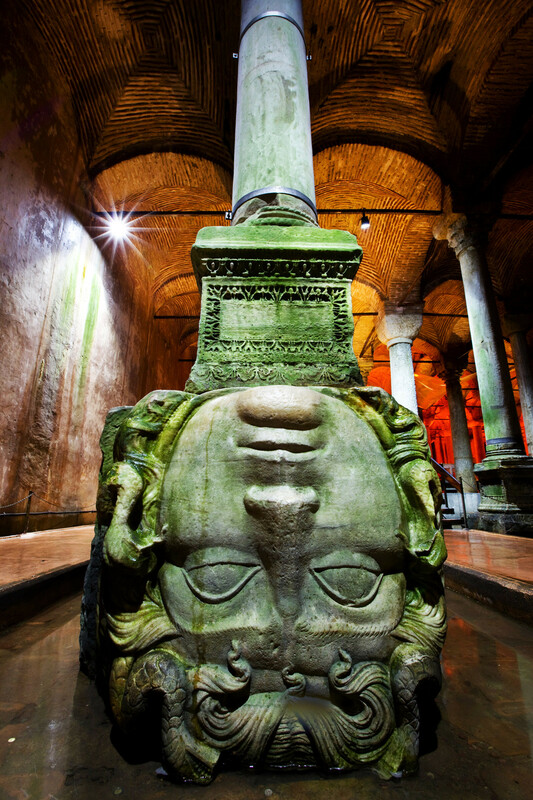 And putting the head of medusa in the cistern was for protecting purposes. According to another rumour, Medusa was a girl who boasted for her black eyes, long hair and beautiful body. She loved Perseus, the son of Zeus. Athena was also in love with Perseus and this made Medusa jealous. Therefore, Athena converted medusa's hairs into snakes. Now, everybody that happened to look at Medusa was gorgonised. Afterwards, Perseus headed off medusa and beat many enemies by using her power. 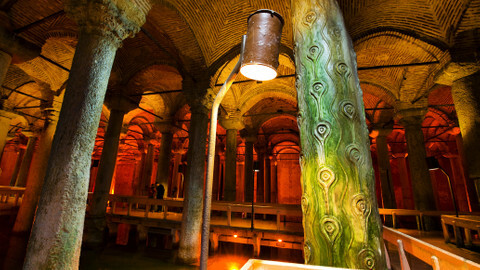 During the rule of Byzantium, the Basilica Cistern used to meet the water needs and requirements of the great palace that covered a wide area where the emperor resided, as well as the other denizens in the region. 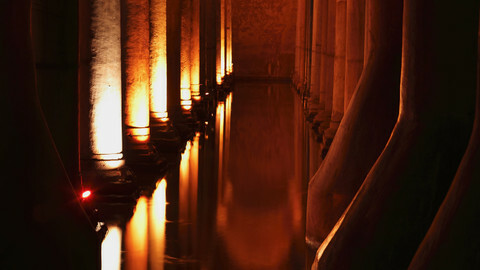 After conquest of the city of Istanbul in 1453, it was used for a little while and water was supplied to Topkapı Palace where the sultans resided.. 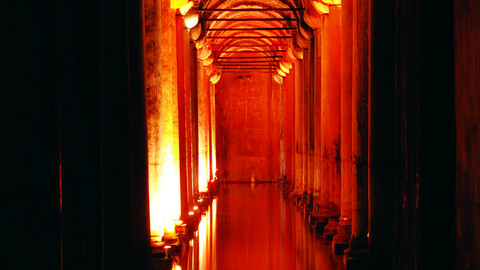 However, the Ottomans preferred running water over still water, and established their own water facilities in the city. It is understood that the cistern was not used thereafter and the western world did not notice it until the mid XVI century. It was in 1544-1550 when P. Gyllius, a Dutch traveller that came to Istanbul for making researches on Byzantium ruins was rediscovered and introduced to the western world. 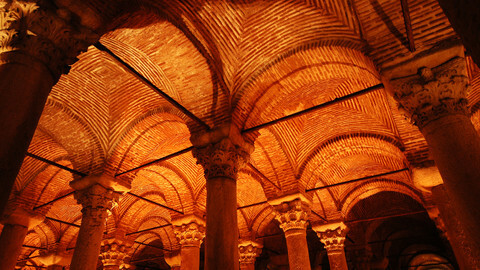 In one of his researches, P. Gyllius, while roaming around Hagia Sofia, managed to enter inside the cistern with a torch carrying in his hand by proceeding from the stone steps that went towards the underground from the backyard of a wooden building surrounded by walls situated on a large underground cistern as he was told that the householders there pulled water with buckets down inside the large round holes similar to well on the ground floor of their houses, and even fished there. 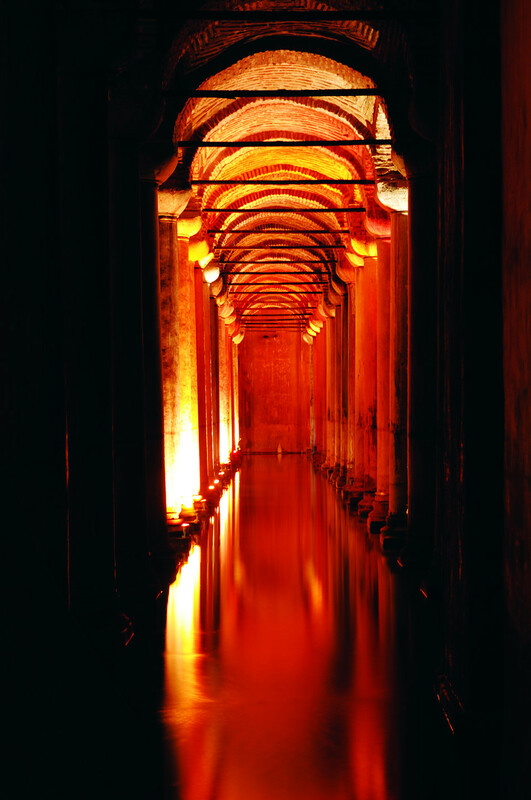 P. Gyllius ranged around the cistern on a rowing boat under harsh conditions, measured it and identified the columns. The information acquired from his experience was published in the travel book, and Gyllius had influence on many travelers. 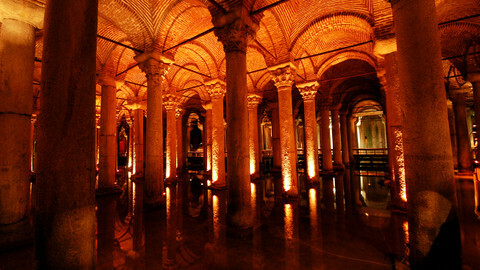 The cistern was subject to repeated renovations since its establishment. 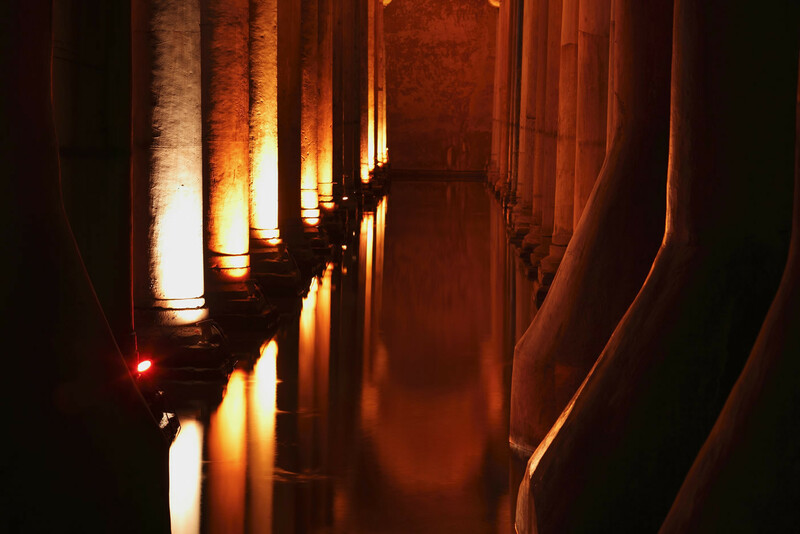 Renovated twice during the reign of the Ottoman Empire, the cistern was repaired during the rule of Ahmed III (1723) by the Architect Kayserili Mehmet Ağa for the first time. And the second repair was made during the rule of Sultan Abdulhamid II (1876-1909). 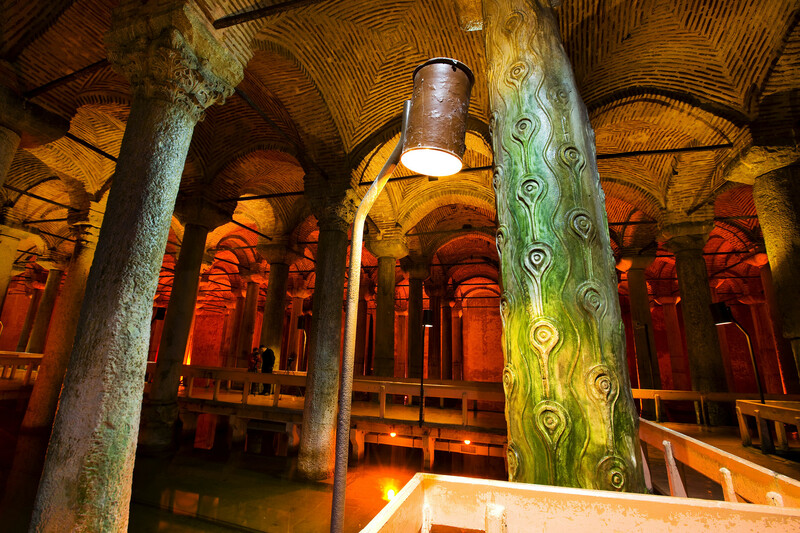 In republican period, the cistern was cleaned by Istanbul Municipality in 1987, and was opened to visits for creating a route. Another extensive cleaning was made in May 1994. 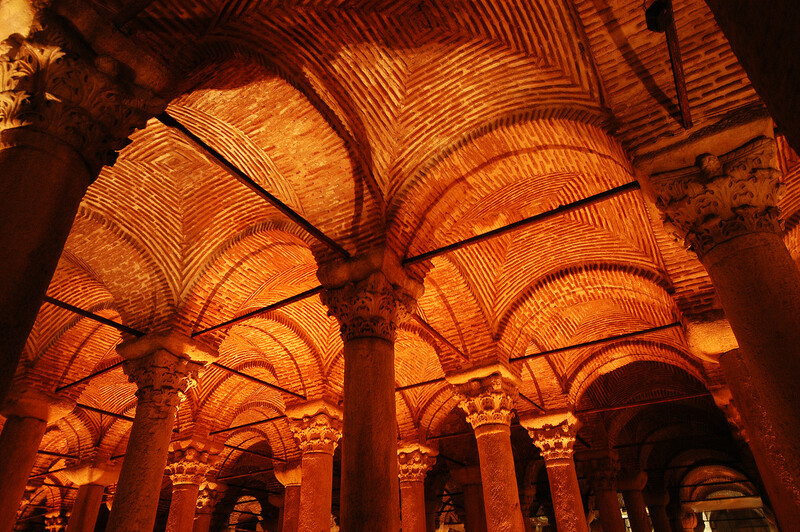 This mysterious venue is an integral part of the Istanbul itineraries and has been visited -among others- by the US former President Bill Clinton, Wim Kok the Prime Minister of the Netherlands, Lamberto Dini, Former Minister of foreign Affairs of Italy, Göran Persson, Former Prime Minister of Sweden and Thomas Klestil, Former prime Minister of Austria until today. Currently operated by Kültür A.Ş. 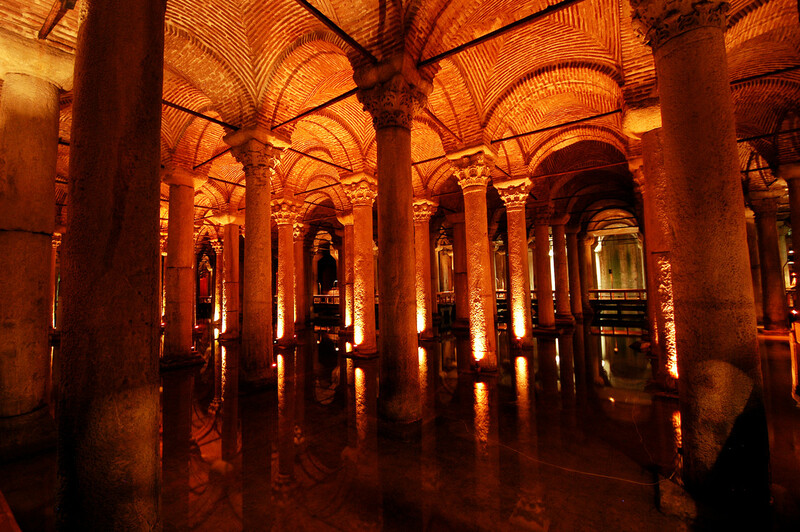 (Culture Co.), one of the affiliates of Istanbul Metropolitan Municipality, the Basilica Cistern functions as a museum and is the home for many national and international events.